Visit us while in Rwanda! The Handspun Hope initiative envisions entire communities freed from poverty. We pursue this by reaching out to the most vulnerable people in Rwanda and creating environments where they are empowered to live out their full potential at work, home and in their spiritual lives. What has resulted is phenomenal. Lives are changed forever, our team continues to grow and we have developed amazing partners who continually spur us on toward our vision. We believe work-based solutions to poverty should restore dignity to impoverished individuals and move them into economic self-sufficiency so that they can become leaders of change in their families and surrounding communities. By providing jobs, education, and encouragement to women who each have an average of four to ten children, they will be more likely to instill those values in future generations. This is the key. This is how lives are changed and how future generations are freed from the poverty cycle. Handspun Hope is a proud member of the Fair Trade Federation. This means our initiative has been fully vetted and found to be in complete compliance with the strict standards held by the FTF. Our women receive above-average salaries in a safe working environment. We consider those who shop with us to be partners in our vision. This movement would not be possible without you. Your choices matter. Your purchases matter. Out of thousands of online stores to choose from, you have come here...and we are grateful. Our pieces are beautifully and ethically made. They are organic and lovingly made by the sweet hands of the women we employ. Thank you for being part of the movement. Thank you for embracing slow fashion. Thank you for choosing to shop for good. Some of the transformations we see in the women we employ are immediate. They earn steady income. They know with certainty that their children (as well as any other children in their care) will have all associated school fees paid and receive their education. The stress and fear of not knowing if or when they will feed their families is lifted from their shoulders. But, there are other, beautiful changes that occur slowly...over time. These are the generational transformations, seen when the children of our ladies have grown up in a poverty-free environment. If you haven't had a chance, click over to our "Featured Stories" page to read about Odette and her daughter, Diana. With every purchase, you bring us one step closer to our goal of full project sustainability. We want to continue to grow our business so that more ladies and their children can know the transformative change that comes from taking pride in their work and providing for their families independently. 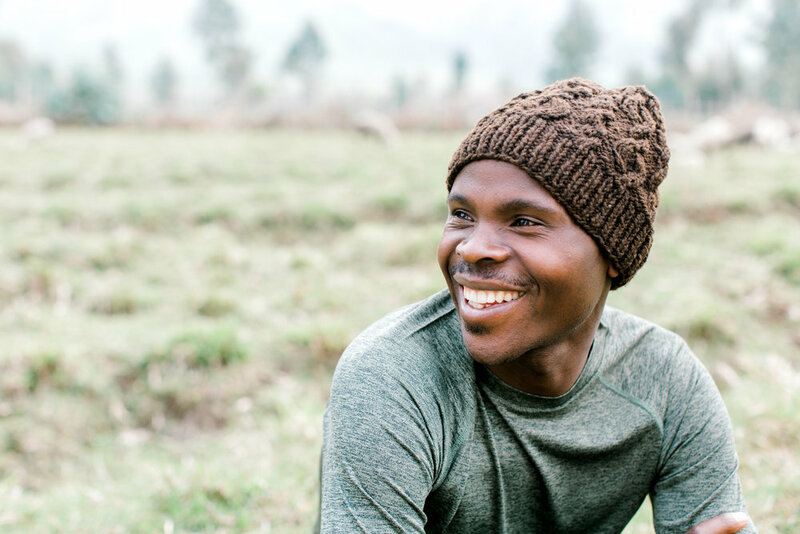 The story of the Handspun Hope production process begins at the base of Mount Sabyinyo in Northern Rwanda. Our herd of Merino sheep are cared for around the clock by our farm manager and team of shepherds. The wool of our sheep is allowed to grow until it is 3.5 inches long. This produces a loftier, softer fiber that is less abrasive than traditional Merino yarn. After shearing, the wool is transported to our facility where the women of Handspun Hope work. The wool is carefully washed, cleaned and combed into fluffy rolags, or rolls, of wool. The rolags are fed into the spinning wheel and transformed into a single-ply yarn by the ladies. Two single-ply yarns are then reverse fed back through the wheel, creating the two-ply yarn used to created Handspun Hope's stunning organic yarn. Every day, the women collect plant material around their worksite or on their walk to work. The vegetation is used to create 100% organic dye baths. Avocado pits, onion skins and Eucalyptus bark are a small example of the vegetable matter used to create our dye baths. When you look at our color palette, you truly are looking at the colors of Rwanda. Once the yarn has been organically dyed it is given to our knitters. Each piece is unique in execution and appearance, ensuring no two Handspun Hope items are exactly alike. The women take pride in their creations...and we do, too. The entire process - from wool growth to knitting - takes approximately 8 months. Slow fashion, indeed...but well worth the wait. Clementine was a familiar face to the Handspun Hope staff. She was often seen working tirelessly as part of a local labor crew carrying impossibly heavy loads of stone and brick on her head. In 2014, Clementine was hired as part of the labor crew working to clear the land where our work facility was to be constructed. Clementine's work ethic and determination were evident. At the end of 2017, Clementine joined the Handspun Hope family. She now works on the land she helped clear, washing newly shorn wool and spending time in the dye house. Odette is one of the "original ten", the first ladies hired by True Vineyard Ministries. At the time of her hiring she was quite pregnant. In fact, Odette gave birth to her daughter, Diana, the very night she was hired. Diana has grown up at the Handspun Hope facility. Before she started school, Diana spent her early years tagging along when her mother came to work. In many ways, Diana embodies the hope we have for the future generations in Africa: she has never known poverty. She has never known what it feels like to go without food. 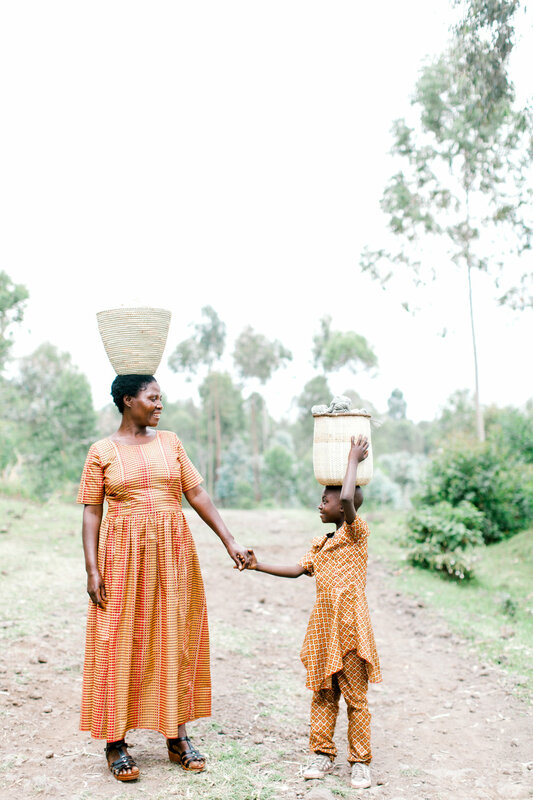 She has never had to worry if her mother will be able to afford her school fees. Diana is a beautiful example of the transformation that takes place when the poverty cycle is broken. It is the goal of Handspun Hope to ensure that every woman under our employ has safe housing for herself and her family. Perusi is the most recent recipient of safe housing. Before her new home was built, Perusi was living in a structure that would be considered unsafe by any standard. Holes in the walls were so large that light was shining through them. The roof was riddled with holes. Rwanda experiences two rainy seasons each year. During these seasons, Perusi's home was in a constant state of flooding and the risk of a complete collapse was high. In the beginning of 2018, work on Perusi's new house was completed and she was able to bring her family into a safe and secure home. The ultimate goal of the Handspun Hope initiative is to achieve economic independence for the women who work for us and sustainability for the program itself. We are projecting full sustainability will be reached by 2025. Join the slow fashion movement and shop an assortment women's, men's and children's knit apparel. 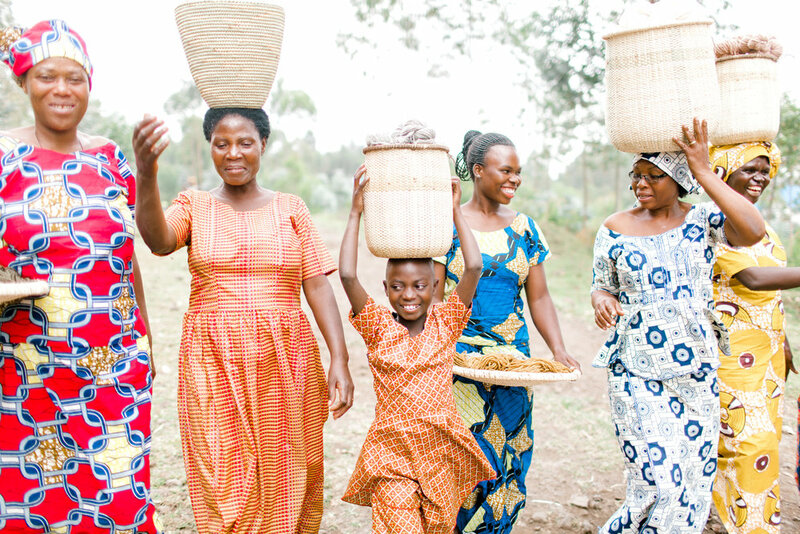 made with love and dignity in Rwanda. Don’t miss the opportunity to visit Umuzabibu Mwiza, home to Handspun Hope, while in Rwanda! During the atrocities of the 1994 Rwandan Genocide against the Tutsi, the rare skill of spinning wool into yarn was completely lost. 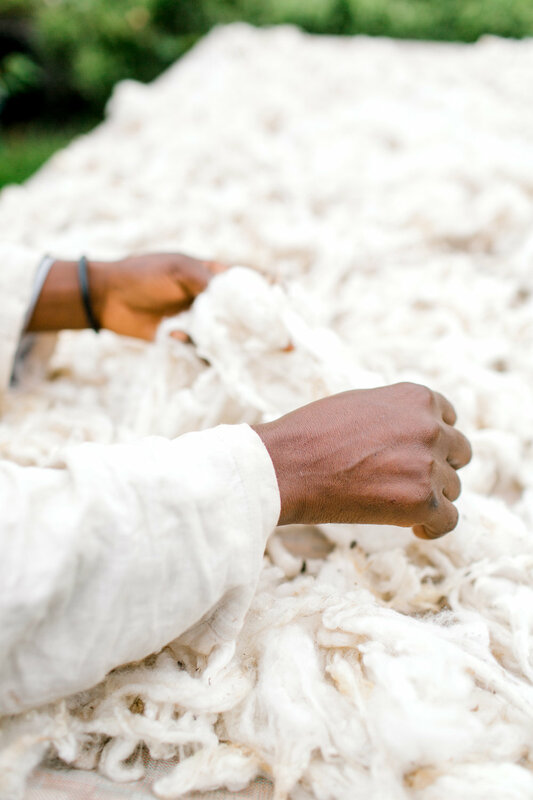 However, in 2008 True Vineyard Ministries reintroduced this craft, along with Merino sheep to Rwanda, so the trade could employ widows and abandoned women. As you visit Umuzabibu Mwiza, witness firsthand this remarkable project and meet the women as they participate in the age old craft of spinning yarn from the fleeces of their own flock of Merino sheep. Using only hand tools and spinning wheels, discover how the women create organic yarn and dye it naturally with native plant materials such as cosmos petals, onionskins and eucalyptus leaves. After your tour, you will have an opportunity to purchase Handspun Hope yarn and hand knit products, once only available through social business partners such as Kate Spade & Company. 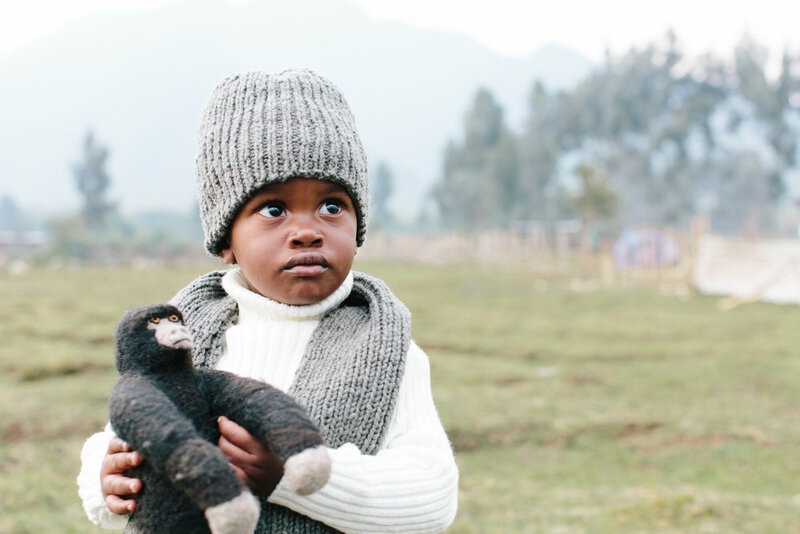 Our newest collection includes hats for all ages, blankets… and even baby gorillas! 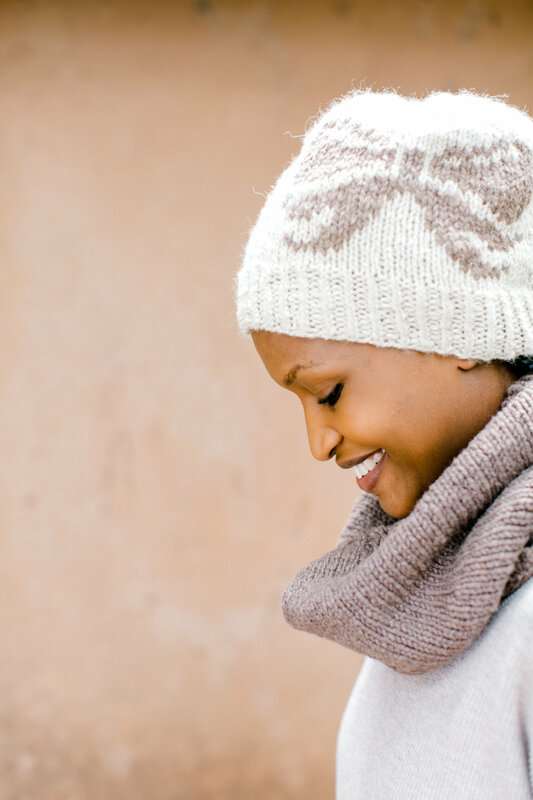 We are certain you will find the perfect Handspun Hope keepsake to take home from your trip to Rwanda! If you have any questions regarding your planned visit to our center, please feel free to contact us in the U.S. or in Rwanda! We are open daily, Monday through Saturday, from 9:00 am until 4:00 pm. Tours are given, as space is available. It is highly recommended that reservations be made in advance. Credit card payments are only available in advance through our reservation page. You should expect to visit Umuzabibu Mwiza for 1.5 to 2 hours. Wear comfortable clothes and shoes and don’t forget to bring your camera! The women of Handspun Hope love to have their photos taken! Turn left (southbound) at Ines University. Immediately bear right at the fork in the road and travel 1.2 kilometers until you see Umuzabibu Mwiza on the right, just past Susa Primary School. Thank you for shopping with Handspun Hope. We are happy to help with any questions you have regarding our product line or your recent order. Please take a minute to fill out the following form and we will be in touch shortly.